This guide is for Outlanders who wish to play an unorthodox build which involving triggering of spells. The build requires the use of at least 1 pistol (with any 1-handed weapon in the other hand) and invests heavily on Focus. No mods are required for this build (there were a few PMs asking regarding this issue). It may seem unusual to see spells not belonging to the Outlander, but such spells can be legitimately acquired through equipment. This guide is also written under the assumption that you have some fundamental knowledge in Outlanders. Some of the information written may be inaccurate, and any constructive feedback would be appreciated. 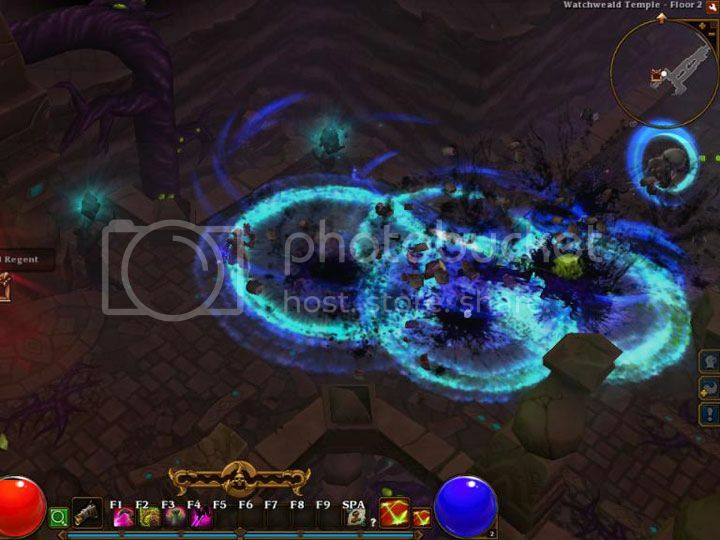 This guide revolves around casting DPS skills to trigger specific spells. These spells cannot be learnt by the Outlander but can be triggered from your equipment. In particular for this build, these spells are [LINK DELETED]. The damage of these two spells are scaled to character level and affected by Focus. For this guide, there will be 2 different 'Modes' which utilizes these triggering spells. These modes are simply switched around by swapping specific weapons, which will be discussed in a while. With the correct equipment combination, the overall damage dealt can be quite substantial which can be seen in the short game play video below. The video links above showcases the potential (and safety) of playing a Spell Trigger Outlander. My character has an average of about 120 Stats Points from each equipped gear though Enchanting, which is quite common for endgame characters. An easy way to understand this build is by examining the [LINK DELETED], which has a 25% chance to cast Glacial Spike from target. Using this weapon to hit a target, either by a normal attack or a DPS skill, has a 25% chance to trigger Glacial Spike. This means that on the average of 4 attacks, only 1 attack will trigger Glacial Spike on the target. However, you can increase your chances by equipping another weapon (which also has a chance to cast Glacial Spike) in your other hand. For the sake of simplicity, we assuming that you are able to stack this chance to 50%. While a 50% chance to cast a skill is still unreliable, you can further boost your chances by using a DPS skill that does multiple hits. 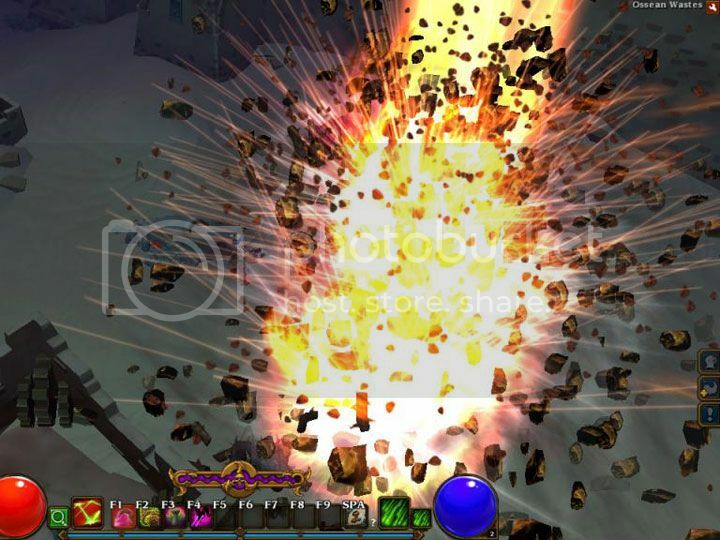 For example, Chaos Burst fires 5 projectiles (at Tier 3) per cast. If all projectiles the hits a single target, the damage output from Glacial Spike alone will have an average damage of 250%. Average damage of 4586.5 (3163 - 6010). Assuming you have a 50% chance to cast Glacial Spike on hit, the average damage output of your Glacial Spike will be about 7116.75 /2 = 3558.38. Just based on average damage alone, Glaive Throw is about 22.4% higher than Glacial Spike. However, Glaive Throw throws only 1 projectile per cast, while Chaos Burst fires 5 projectiles per cast to trigger Glacial Spike. If all Chaos Burst projectiles hits the target, the average damage from a single cast of Chaos Burst will be 3358.38 x 5 = 17991.9. This damage output is about 392% higher compared to Glaive Throw. While it does seems impressive at first glance, to achieve such a high damage is extremely situational. Glacial Spike can be triggered by any DPS skills. 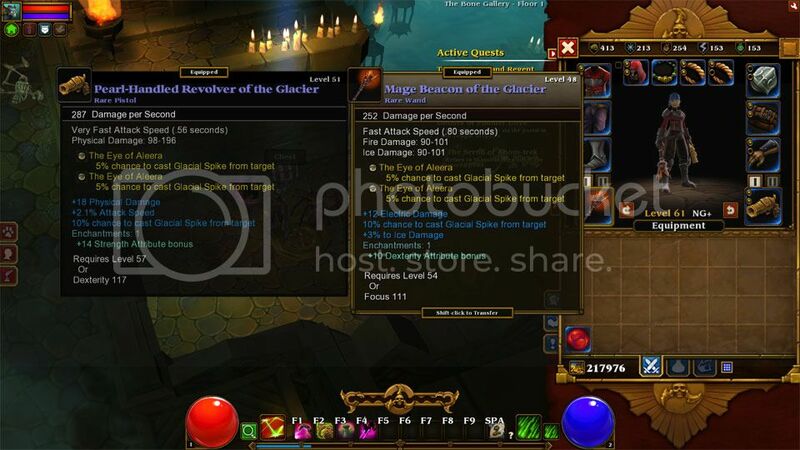 You will want to choose skills which are able to do multiple hits so as to have more chances to trigger Glacial Spike. For Outlanders, such skills are all under Warfare Skills (will be discussed in a while), which will require you to equip a bow, crossbow, shotgonne or pistol. The easiest way to achieve this is to equip your weapon with the socketable [LINK DELETED], which has a 5% chance to cast Glacial Spike from target. By equipping 2 1-handed weapon with 4 sockets, you can achieve a 40% chance. However, this will further limit your weapon selection to equip at least 1 pistol as bows, crossbows and shotgonnes are 2-handed weapons. This is a channeling skill which fires a rapid burst of projectiles that force enemies back and strip away their armor. The initial range is 7 meters (12 meters at Tier 2). Note that if you are using a pistol, this skill requires the pistol to be equipped in your right hand. Each cast of Chaos Burst fires 3 ricocheting projectiles (5 projectiles at Tier 3). These projectiles pierce any foes as well. You are able to hit Bramble Wall with some skills, including normal attacks. Since there is a few seconds delay before Meteor Strike falls to the ground, you can 'cast' a Meteor Strike in advance by hitting the Bramble Wall before the foes approach. This concept is similar to Glacial Spike Mode. Except that out of the 3 DPS skills recommended in the section earlier, only Venomous Hail is able to hit Bramble Wall. be as high level as possible for better Physical/Elemental armor bonuses, and better enchantment bonuses. Glacial Spike has a 100% chance (4 second duration) to Immobilize the target, which is extremely effective for crowd control. Once Immobilized, foes will not be about to move and you can take them out safely from a distance (note that foes with range attacks are able to retaliate). Unlike debuffs like Blind and Silence, there is no visual indication above the head of an Immobilized target. There is however some ice shards around the feet of your target as indication (which isn't very obvious). Of course, you can simply assume that your target is Immobilized once it stops moving around. Foes are only able to attack you if they are facing you directly. Besides unable to walk, an Immobilized target is unable to turn as well. Use this to your advantage by repositioning yourself whenever possible. You can safely move close to the side of your target to spam Chaos Burst and your target will not retaliate at all. This short video shows a few examples of fighting bosses by making use of Immobilization. This section provides some guideline on how to begin playing a Spell Trigger Outlander. You need not follow the information written here exactly as this is just a reference. Clear Act 1, Act 2 and Act 3 by using Wands and a point into Glaive Throw (you may want to Respec away the point invested into Glaive Throw later, just remember that you can only Respec the last 3 Skill Points). Alternatively, try trading for the [LINK DELETED] from other players (should not be difficult as there are a lot online games which are not NG). You can get this socketable from Ossean Wastes (Mysterious Socket), although it cannot be farm repeatably. The Yellow Basilisk Eye has a 5% chance to cast Thunder, which does instantaneous electric damage. Look for 2 socket 1-handed weapons (including at least 1 pistol) from the Blacksmith in Act 3 (for Meteor Strike Mode). You will be looking out for level 38 to 40 weapons. Look for 2 socket 1-handed weapons (including at least 1 pistol) from the Blacksmith in Act 4 (for Glaical Spike Mode). You will be looking out for level 50 to 52 weapons. The Spell Trigger Outlander is has the potential to be one of the highest damage build. The AOE damage and immobilization effects from Glacial Spike provides good crowd control over foes, while the Meteor Strike setup provides almost an instant skill on any boss. As this build invests heavily on Focus, Mana is less of a problem compared to other strength build Outlanders who also uses ranged weapons. However, this build suffers from some survivability issues due to not using a shield, as well as inconsistent damage from the unreliable chances to trigger spells. If this build works well for you, do let me know. Any comments will be highly appreciated. Thank you. is it me, or is the video not working? edit: One more thing, how do you level with this build? Looks like it needs some heavy twinking/farming, is that right? ive tested this build with a console character. the dps is more immense than a glaive lander, has more cc to boot and extremely wide area coverage based on what skill is used, chaos burst makes it absolutely brutal..
but i gotta admit this is build is much more fun and has higher dps potential but way more expensive than most builds for standard leveling. Levelling a faceroll build to 100 then respeccing into this is not fun at all in my book. Is there a way to level with this (at least start in early NG+, maybe late NG) if you farm up some stuff with your alt? This video might be what you are looking for, but the play style of this build is very similar to any Outlander with a ranged weapon when taking out normal mobs. I leveled this build using wands and a point into Glaive Throw, until I managed to equip level 50+ 4 socket pistols. Gear farming was done mostly by my Embermage, except for the Eyes which were farmed by my Outlander (took me 1 whole day as it takes longer to reach Vyrax). You are correct about starting this build at the end of the game without any NG. I have not tested them yet, but there are some potential combinations of this Spell Trigger build together with the Mad Genius Hybrid Build. The wand provides a 100% chance to cast Fire Storm (fire DOT + 67% chance to flee). The flee chance might be irritating but it could provide some safety as well. Since the wand provides a 100% trigger chance, we could add 6 [LINK DELETED] for extra 360% crit damage. The wand provides 25% chance to cast Thunder. By adding all 6 sockets with [LINK DELETED], we will get 55% chance. I am unsure about the potential of Thunder, but Glacial Spike provides more safety from the chance to freeze + immobilize. Damage wise, I think this combination might have a better output. 3. [LINK DELETED], we will get 35% chance to cast Glacial Spike. It may not be as interesting as the first 2 ideas but it could work out nicely as well. since others had commented that this build does better damage than glaive, i am wondering will the dps be comparable to the popular shotgonne build? Ive been using a 4-socket mod for my Outlander for 2h weapons for some time now, and a few months ago I experimented with on proc effects/dot stacking using a 2000 Focus Elemental Shotgun build. I tried meteor, zardon, aleera, verona and chaotic rift. Meteor is bar far the best for bosses, and aleera is best for trash indeed. I do see this as a natural mutation of a focuslander/glaivelander/mad genius style build, and a very good one at that. However, even with insane gear, equally insane Glaivelanders can happily crit out 1,000,000+ Shattering Glaives, and a physical Outlander can do that with a CB Volley too. The issue inside Tartarus/certain Elite maps in general is surviving, and weapon switching can often be cumbersome. I have desperately tried to make a Focus-based Shotgonne (to abuse Blind) and stack proc effects (to abuse them with crazy Focus) but even after trawling the best gear I can possibly find, Physical Shotgonne>Focus/Proc effect Shotgonne by a very large margin. Of course, getting the 2-4 extra sockets from DW really ramps up the potential of the build, but at a cost of losing Blind. Well done for a clear, concise post and for taking the time to point out the way you did things. A good read! i am wondering will the dps be comparable to the popular shotgonne build? First of all, lets not turn this topic into any heated DPS debate. Take my comparisons below with a pinch of salt. With regards to the Shotgonne build, the best weapon setup is probably equipping [LINK DELETED]. With 2 [LINK DELETED] and 1000 Strength, you will have 450% Critical Damage Bonus and do 47881 damage on a critical attack (based on Arcane Statistics). With regards to the Spell Trigger build, the best weapon setup is probably equipping a 4 socket pistol with the [LINK DELETED]. With 6 [LINK DELETED] (for a maximum of 55% chance to cast Glacial Spike) and 1000 Focus, you will have 50% Critical Damage Bonus and your Glacial Spike does 64050.75 on a critical attack (at level 100, Glacial Spike does a fixed damage of 7116.75). However with only a 55% chance of triggering Glacial Spike, the correct average damage should be dropped to 35227.9 instead. Thus, the main difference in damage output between the 2 builds will depend on which DPS skill you are using. I agree that Blind is very effective against bosses. Once debuffed, they will not attack and simply just walk around. Based from experience, the Immobilization effects from Glacial Spike is enough to provide safety for most situations (with a few exceptions when the champion or boss has a ranged skill). From this video, the first 2 bosses are Immobilized and killed without being able to move at all. The solution against ranged champions and bosses came when I equipped 2 pieces of the [LINK DELETED] set which provides a 2 second Silence duration. With the Immobilization (from Glacial Spike) + Silence (from Unearthly Set), attacking any champion or boss from a range will cripple them almost the same way as Blind. I just completed this build (Glacial Spike only) and I have to say, it is Awesome! Took a while to farm for the Eye of Aleeras, but well worth it. But, still I die very quickly in Veteran mode. Have to do something about survivability. Repulsion Hex and the immobilization effects from Glacial Spike should be able to provide you safety from most melee foes. But like almost any other builds, getting a good amount of Damage Reduction (and Health) from your equipment is very important as well, especially when you do not have a shield). Try farming for [LINK DELETED] by doing 'Blue' Chest runs at from Act 1 in NG (I spent 3 days farming for 13 skulls). You can try to gamble for [LINK DELETED] as well. As an Outlander, we are blessed with Dodge Mastery and Share the Wealth to help us achieve the max Dodge rate quite easily (with some Dexterity enchantment from our equipment). DIdn't know that Meteor Strike can be cancelled and then resume,this is a great found. Have you try Cursed Daggers with this build?It does a poison dot,and greatly reduce enemy damage (34% at lvl 15),increase our move speed/critial hit chance/damage for a short time,great choice for this build i think. i love your meteor strike stategy for bosses. there is another possible setting for bosses though: you could use the wand with 10% or the one with a 15% chance to cast blinding cloud. i'm currently working on a spell trigger embermage build and in terms of dps it should by far surpass even this outlander though after watching your videos i got to admit its ridiculous to aim for more dps seeing how you instantkill everything. sadly embermages do not have bramble wall. so in case bosses dont die fast enough for us to survive we could use the blinding cloud wand on weapon switch limitting our dps or we can use ice prison. not sure which is better since i am far from done tweaking my mage (just got it to lvl 60 on elite). I feel that the Cursed Daggers is potentially useful for almost any build. The damage reduction could be especially effective against dangerous foes (like bosses) that do not die in a few hits. To be very frank, I did not choose Cursed Daggers as I wasn't completely sure with the mechanics of some Outlander Skills (this build is my first Outlander). For trigger spells at level 100, you can check the damage in Console by typing the command 'COMBATLOG'. There are 3 types of trigger spells that does instant damage (non-damage over time). These are Glacial Spike, Meteor Strike and Thunder. I think you are referring to [LINK DELETED]. Icy Blast does 7 hits at Tier 3, but has a short cool down (which means that this spell cannot be spammed). To keep the long story short, I got very interested in trigger spells after I found a [LINK DELETED] (100% chance to cast Fire Storm from target). Next, I started to experiment intensively on the various trigger spells. Before I wrote this guide, I was also maintaining a Spell Trigger Embermage (Shockbolts) and Berserker (Ravage). I will probably play a Spell Trigger Engineer (Emberquake) someday too. You can try to 'farm' for blue weapons (from the Blacksmith in Town) that have a chance to cast Glacial Spike. In this way, all you need are 4 [LINK DELETED] for the Glacial Spike mode. Below is a screenshot of my new rerolled Outlander in NG+. Unfortunately you cannot use this method for Meteor Strike mode, as blue weapons seem to only can have a 5% chance to cast Meteor Strike. I love this build, and it's pretty much the only reason I play(ed) this game. I'm only level 76, but I powered through all the way and am currently sitting at the end of NG+++. It took me only 10 hours of farming to get like 8 eyes of Aleera, with a total of like 25 hours on the character. I didn't rush, the build is just too strong and wipes out everything too fast. I literally have no gear, just like 400 focus, a 2 socket pistol and a 4 socket wand for 6X eyes (30% chance to glacial spike). I can instantly kill basically any monster on NG+++ Elite, glacial spikes smashing repeatedly for anywhere from 35k-90k damage while I rapidfire/volley. Obviously, I die in one hit from everything with no survivability, even on Casual mode, but I don't really care because I'm good and don't get hit. I've kind of stopped playing and I'm not interested in getting to 100 and decking myself out with survivability and more damage for the simple reason that the Torchlight 2 devs screwed everyone completely. In Normal mode there are literally 300 online games to choose from. In NG+ there are about 50 games to choose from. In NG++ there are about 5 games and now in NG+++ there are about 2 online games. This game is literally a ghost town at higher NGs because of the retarded decision to segregate players based on difficulty, and I just can't have any fun. I started playing this game to play online, but it looks like that's not going to happen. And I don't see the point in rerolling and staying in Normal because that's not fun at all; you can't farm for really high end gear in normal, unless you fill yourself up with magic find and run level 100+ map rooms, and even then, that's boring, slow, easy and extremely stupid. So I might come back to this game in the future, but it doesn't look like the developers care about multiplayer in the slightest, which is pathetic. The PVP is also stupid. Everybody dies in one hit, no matter what, because player HP is so low in comparison to the millions of damage you can dish out. Even with 75% damage reduction, it's just a matter of who hits the other player first. You can't even create games with a checked PVP flag or anything from the game creation menu, so the majority of players don't even know the game has PVP, and there are certainly never any Dueling/PVP games. I don't understand why developers can't just learn from Diablo 2. It was a masterpiece in every sense of the word, and will continue to be, forever, between the fantastic hostility system (you know, back when video games were designed for actual people, not children), attack rating (wow, such a difficult and hard concept to implement, right Torchlight and Diablo 3? ), and tiny hitboxes so that kiting actually takes skill and is useful (as opposed to dozens and dozens and dozens of skills that AOE DPS every single pixel on the screen, usually multiple times per second...). Even people who were on the development team for Diablo 2 are apparently too stupid to understand what made the game great, considering many of them worked on Torchlight and D3, so I guess it was just a freak accident. Anyways, I am interested to know how your glacial spikes in your videos ended up hitting for like 1.5-2 million a pop. Getting from my randomized 35k-90k to over a million seems like a big stretch. What does that require? Like 5000 focus? +% ice damage? What kind of enchantments you running to output that much damage? And for all you people with braincells that agree with my post, maybe Marvel Heroes will end up being what we want and need. Actually, I only do around 150k to 200k on a critical hit (the video quality on YouTube is a little blur ). I have 1200+ Focus and do not have any ice enchantments. I think it is not possible to get 5000 Focus, as getting 2000 Focus legitimately is already a very difficult task. I updated a Tartarus Extreme video and a Tips on using Immobilization video to this guide. I was interested to test out this build at much higher levels, but hesitated for quite a while before getting the dungeon mod (I am a vanilla player). Anyway, this guide is now more or less the complete version.